The Institute of Politics (IOP) hosted a panel discussion Thursday featuring two health care policy specialists. The panelists spoke on the future of the Affordable Care Act (ACA) under the Trump administration. The event was part of the IOP’s “America in the Trump Era” series. The event was moderated by Jackie Calmes, a national correspondent for The New York Times and visiting Institute of Politics fellow. 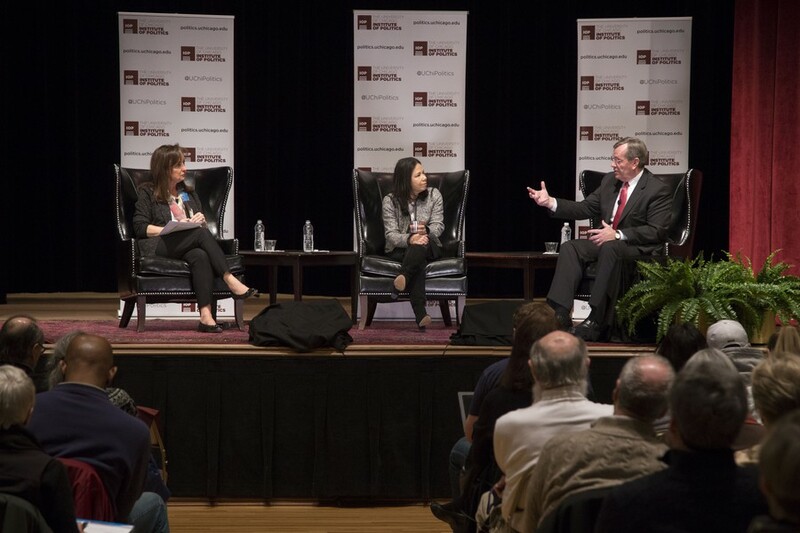 Nancy-Ann DeParle, former director of the White House Office of Health Reform, and Michael Leavitt, former U.S. Secretary of Health and Human Services and Governor of Utah, discussed the future of health care under the current administration. Calmes turned first to Leavitt and asked how the current administration will play on its promise to repeal and replace the Affordable Care Act. DeParle spoke about the potential costs of repealing and replacing the ACA, which several Republican members of Congress have vowed to do as soon as possible. “The Republicans in Congress and President Trump have gotten themselves into a corner where they have to have something to repeal. I do worry that having that conversation is having the opposite effect that they say they want on the markets and on our health care system. They say they want everyone to be covered—beautifully covered as President Trump says—low costs, and this ideal world,” she said. DeParle went on to say that the Affordable Care Act was built on years of bipartisan work, which she described as a uniquely American way of solving health care issues concerned with cost and coverage. Leavitt said that repealing and replacing the ACA is not about health care at all, but rather about strengthening government control and symbolizing what voters want their government to look like. He added that what he thought people were rejecting was not just the act itself, but a dysfunctional government. Republicans, he argued, made the ACA a symbol of government dysfunction. Calmes then asked DeParle what actions the Democrats will take, given that they are in the minority in both chambers of Congress. DeParle said she thinks the Democratic Party will work first on stabilizing marketplaces. Although getting votes in the Democratic caucus will not be easy, she said, she believes that the majority of the party will not help to repeal the ACA.